Pass the edamame and read this book! Soybeans, or edamame, are not a particularly exotic foodstuff in the United States these days, but as recently as the 1950s, they were grown only as feed for livestock. Yet for thousands of Chinese immigrants, they were a rare and welcome taste of home. 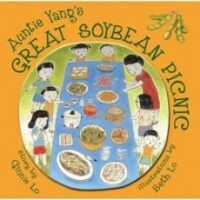 AUNTIE YANG’S GREAT SOYBEAN PICNIC by Ginnie Lo tells the story of a small soybean picnic (just a couple of families and a couple of quarts of soybeans taken from a local field) and how it grew to become a huge annual event, with hundreds of families gathering to eat thousands and thousands of soybeans. The book is richly detailed, but not overwhelmingly so. The narrator, a young girl, plays with her cousins, helps her mother and auntie cook, and eats more dumplings than anyone else! There’s also a scattering of Chinese vocabulary, with a small guide at the back. Beth Lo's illustrations are especially fascinating. They’re actually painted on plates, and then photographed. So the illustrations are round, ever so slightly concave, and of course, they reflect the central idea of the book: a shared meal. Also, they’re beautiful and fun to look at and explore. The story is slow at times. It is much more about sinking into a different moment, a different culture, than it is about racing to find out what happens. The plot, such as it is, is gentle. However, the illustrations and cheerful narrative voice create a child-sized world for a curious reader to explore. When a book is based on a true story – and what’s more, a story from the author’s own childhood – I am instantly suspicious. Such stories often have great personal meaning, but they don’t necessarily translate to a winder audience, because real life is so rarely narrative ready. In this case, however, the story is pitch perfect, and one well worth sharing with a class, or a child, perhaps with a bowl of edamame to snack on while you read.